Non-eosinophilic asthma is present in 53% of patients presenting to an adult respiratory clinic with symptomatic asthma.9 Other investigators have reported the absence of a sputum eosinophilia in up to 50% of patients with refractory asthma,9 patients studied during an asthma exacerbation10 and patients taking high doses of inhaled corticosteroids.6 In a recent longitudinal study of patients with severe asthma, the absence of sputum eosinophils has been reported to be a stable feature in a number of patients observed over 12 months;11 another study showed that it was present in untreated symptomatic patients as well as those receiving inhaled corticosteroid therapy.9 These observations suggest that, in some patients at least, non-eosinophilic asthma is a stable phenotype that is not solely explained by the effects of corticosteroid therapy. Several studies have noted that an airway neutrophilia is often present in patients with non-eosinophilic asthma, and Wenzel et al7 reported a predominantly neutrophilic airway inflammatory response with an absence of eosinophils and normal basement membrane thickness in a subgroup of patients with refractory asthma from whom bronchial biopsy specimens were taken. These findings support the concept that non-eosinophilic asthma is a pathologically distinct entity, although the extent to which these findings reflect the effects of treatment remains unclear. The aim of this study was to compare the immunopathology of eosinophilic and non-eosinophilic asthma with normal controls in patients with symptomatic asthma who were not treated with inhaled corticosteroids. We also set out to compare the response to 8 weeks of treatment with the inhaled corticosteroid mometasone in a prospective randomised, double-blind, placebo-controlled crossover trial in patients with non-eosinophilic asthma and in a subgroup with eosinophilic asthma. Subjects were recruited from Glenfield Hospital clinics and by local paper advertisement. All subjects with asthma had symptoms of episodic cough, wheeze or breathlessness such that their Juniper asthma control score was >1.57 points, a level which is consistent with the Global Initiative for Asthma (GINA) recommendations for an increase in treatment. Subjects had at least one of the following objective measures of airway hyperresponsiveness and/or variable airflow obstruction: concentration of methacholine provoking a 20% fall in forced expiratory volume in 1 s (FEV1 PC20) of <8 mg/ml, increase in FEV1 of 15% or greater following inhalation of 200 μg salbutamol and/or peak flow amplitude as percentage of mean over 14 days of >20%. Patients with eosinophilic asthma were recruited in two separate groups, one for the bronchoscopy study and one for the placebo-controlled study (fig 1). Normal control subjects had no respiratory symptoms, normal spirometric values and a methacholine PC20 of >16 mg/ml. Figure 1 Plan of study. NO, nitric oxide; AQL, asthma quality of life; PC20, concentration of methacholine provoking a 20% fall in forced expiratory volume in 1 s.
Non-eosinophilic asthma was diagnosed in patients who had a sputum eosinophil count below our normal range (1.9%9) on at least two occasions separated by 1 month while still symptomatic with a Juniper asthma control score of >1.57 points and while not receiving inhaled or oral corticosteroids. All patients with non-eosinophilic asthma had no evidence of bronchiectasis on a high-resolution CT scan. Patients who had symptoms due to rhinitis and gastro-oesophageal reflux disease were excluded. Our criteria for identifying these symptoms has been previously described.12 None of the patients had ever smoked, had a respiratory tract infection within 6 weeks of recruitment or had received inhaled or oral corticosteroids for 3 months before entering the study. The Leicestershire and Rutland ethics committee approved the study and all patients provided informed written consent. Sputum levels of interleukin (IL)-8, cysteinyl leucotrienes and histamine were measured using standard ELISA kits (BD Pharmagen, Immunotech and Cayman Chemicals, respectively) and eosinophilic cationic protein (ECP) was measured using a fluorescence immunoassay (UniCAP test, Pharmacia, Uppsala, Sweden). These assays have been previously validated for use in sputum supernatants.18 The sensitivity levels of the assays were 2, 13×10−3, 0.8×10−3 and 50×10−3 ng/ml for ECP, cysteinyl leucotrienes, IL-8 and histamine. The intra-assay coefficient of variability was 5–10% and the interassay coefficient of variability was 3–15% across a range of concentrations of mediators measured. Bronchoscopy was performed according to British Thoracic Society guidelines. 20 ml of warmed sterile saline solution was instilled into the bronchus intermedius, aspirated and analysed as the wash sample. Three sequential samples of 60 ml warmed sterile saline solution were then instilled into the middle lobe bronchus and aspirated; the pooled aspirate from these samples was analysed as the BAL fluid. Biopsy specimens were taken from the middle and right lower lobe carinae. The BAL fluid and bronchial wash aspirates were filtered through 48 μm gauze and diluted to a cell concentration of 0.5×106 cells per/ml for cytospins and 5×106 cells per/ml for flow cytometry. Cytospins were made with 75 μl aspirate and stained with Romanowski stain before being counted by a person blind to the details of the subjects. Cell counts were given as a percentage of at least 400 inflammatory cells counted. Flow cytometry was used to measure CD4, CD8, IL-4 and interferon gamma (IFNγ) on CD3 positive lymphocytes from peripheral blood and BAL fluid cells using commercially available antibodies as previously described.19 IL-4 and IFNγ were measured using intracellular staining following stimulation for 4 h with phorbal 12-myristate 13-acetate (PMA) and calcium ionophore as previously described. Patients were identified as having eosinophilic or non-eosinophilic asthma on sputum criteria as part of a standard clinical assessment before recruitment. All patients with non-eosinophilic asthma had a CT scan as part of their clinical evaluation to exclude subclinical bronchiectasis. Following recruitment, patients attended for a screening visit at which the concentration of exhaled nitric oxide was measured before skin prick testing, spirometry, methacholine challenge testing and sputum induction. Patients with non-eosinophilic asthma attended for a second screening visit at last 4 weeks after the initial visit, at which symptom scores and the sputum differential cell count was repeated. Only patients with persistent non-eosinophilic asthma proceeded to bronchoscopy and the placebo-controlled study. All assessments were performed at the same time of day, at least 6 h after the last dose of short-acting β2 agonist. Because of the possibility that sputum induction could alter airway immunopathology, bronchoscopy was performed at least 10 days after the screening visit. 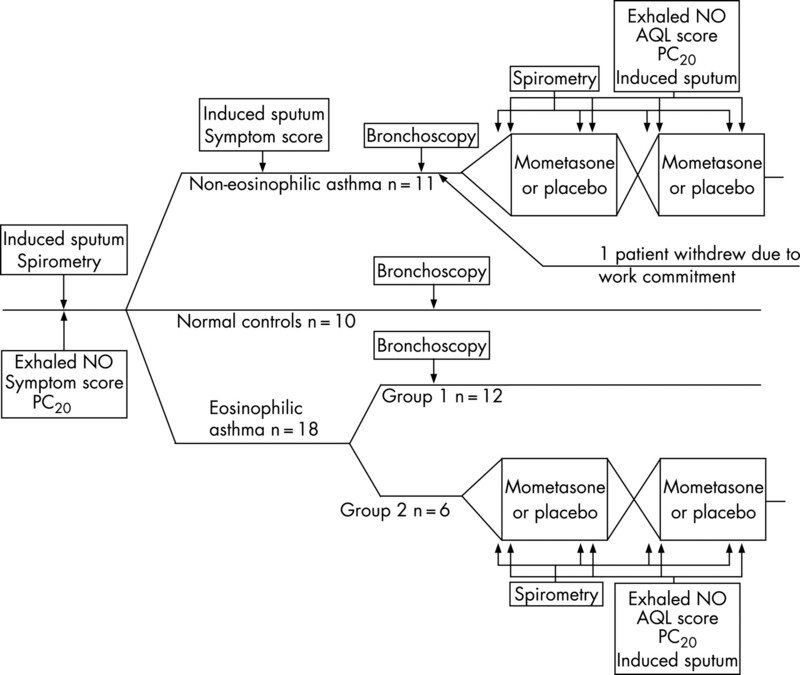 At least 4 weeks after bronchoscopy, patients with non-eosinophilic asthma were entered into a randomised, double-blind, placebo-controlled crossover study of inhaled mometasone; a separate group of patients with eosinophilic asthma entered this study as a comparison group (fig 1). Flow independent exhaled nitric oxide parameters, spirometry, methacholine PC20, induced sputum, symptom visual analogue scores and asthma quality of life were measured at baseline and after 8 weeks of each treatment, 24 h after the last dose of study medication and more than 6 h after the last dose of inhaled short-acting β2 agonist. Placebo or mometasone 400 μg were inhaled once daily via matched Twisthaler devices. Treatment phases were randomly allocated; they lasted for 8 weeks and were separated by a 4-week washout phase. The order of treatment was determined using a randomisation sequence prepared from a random number generator. The study drugs and randomisation codes were stored in the hospital pharmacy and could not be accessed by the investigators. Data were tested for normality of distribution using the Kolmogorov-Smirnov test. Data which where log normally distributed were log transformed before analysis. Between-group comparisons of three groups were made using one way ANOVA with Tukey’s post hoc test for individual group comparison when data were normally distributed or Kruskal-Wallis test when they were not. Between two groups comparisons were made using either independent t tests or the Mann-Whitney U test according to distribution. Descriptive statistics are given as mean (SE) for normally distributed data, geometric mean (log SE) for log normally distributed data and median (interquartile range, IQR) for data that were not normally distributed. The bronchial biopsy study was a descriptive hypothesis-generating study, so no power calculations were performed and no adjustment was made for multiple comparisons. Primary outcome measures for the mometasone trial were difference in doubling concentration change in methacholine PC20 between placebo and mometasone at 8 weeks and difference in change in asthma quality of life score between placebo and mometasone at 8 weeks. Differences in primary outcomes were compared within groups using paired t tests and between groups by unpaired t tests; the period and order effect were analysed by analysis of covariance (ANCOVA). Secondary outcome measures were net change in post-bronchodilator FEV1, symptom visual analogue score, exhaled nitric oxide concentration, sputum eosinophil count and sputum neutrophil count. This study was analysed as a mechanistic study and only data from patients who completed both treatment phases were analysed. We chose methacholine PC20 as a co-primary outcome as it was the most responsive outcome measure in an earlier study. Asthma quality of life was chosen as a second primary outcome as it was felt to be a more patient relevant outcome than PC20 and potentially allowed us to evaluate a different component of the corticosteroid response. The study had >80% power to detect a two doubling concentration difference in net change in methacholine PC20 between the two treatment groups. The characteristics of the study subjects are given in table 1. Patients with asthma had a significantly lower FEV1 (percentage predicted), ratio of FEV1 to forced vital capacity (FVC) and methacholine PC20 and significantly higher β2 reversibility than normal controls. There was no difference between eosinophilic and non-eosinophilic asthma. No patients classified as having non-eosinophilic asthma at the first visit developed a sputum eosinophilia (>1.9%) at the second visit or at any other point during the investigation. Patients with non-eosinophilic asthma had lower sputum eosinophil counts, bronchial wash eosinophil counts and BAL fluid eosinophil counts than patients with eosinophilic asthma (table 2). There was no significant difference between sputum, bronchial wash and BAL fluid neutrophil counts, although a trend towards higher sputum neutrophil counts in non-eosinophilic asthma was noted (table 2). There was no difference in the percentage of BAL fluid lymphocytes positive for IL-4 or IFNγ, or in the blood or BAL fluid lymphocyte CD4/CD8 ratio between the groups. Following embedding, cutting and staining, adequate biopsies suitable for counting were obtained from the following number of normal controls, patients with eosinophilic asthma and patients with non-eosinophilic asthma: submucosa (9, 7, 10), airway smooth muscle (5, 7, 6) and subepithelial layer (7, 11, 7). There were no significant differences in the clinical characteristics of patients from whom adequate biopsies were obtained and those from whom they were not. Patients with eosinophilic asthma had a median (distance) of 23 (29) bronchial submucosal cells positive for major basic protein per mm2 which was higher than both normal controls (0 (9.4) cells/mm2) and patients with non-eosinophilic asthma (4.4 (7.9) cells/mm2; p = 0.03, fig 2A). There was no significant difference between the groups in the number of submucosal cells positive for tryptase (13 (5.7) vs 11 (15) vs 22 (33) cells/mm2; p = 0.52); however, the number of tryptase positive cells in the airway smooth muscle was increased in patients with eosinophilic asthma (8 (12) cells/mm2) and those with non-eosinophilic asthma 9 (56) cells/mm2) compared with normal controls (0 (1.8) cells/mm2; p = 0.016, fig 2B). There were no significant differences in the number of submucosal cells positive for neutrophil elastase. The subepithelial layer thickness was 10.3 (3.1) μm in patients with eosinophilic asthma compared with 5.8 (3.0) μm in those with non-eosinophilic asthma and 5.1 (2.1) μm in normal controls (p = 0.002, fig 2C). The sputum supernatant IL-8 concentration was significantly lower in patients with non-eosinophilic asthma than in normal controls and patients with eosinophilic asthma (table 2). Figure 2 Inflammatory cell counts in bronchial biopsy specimens from patients with eosinophilic asthma, non-eosinophilic asthma and normal controls. One patient with non-eosinophilic asthma withdrew from the study after bronchoscopy because of work commitments. No patients withdrew from this part of the study after enrolment. Treatment period or order did not influence values before treatment or the change in primary outcome measures. Compared with placebo, 8 weeks of treatment with inhaled mometasone led to a net doubling concentration improvement in methacholine PC20 of 5.5 (95% CI 2.0 to 9.0; p = 0.01) in patients with eosinophilic asthma and 0.5 (95% CI −2.4 to 3.3; p = 0.72) in the non-eosinophilic asthma group (mean difference 5.1 doubling doses, 95% CI 1.1 to 9.1; p = 0.018). There was a net improvement in Juniper asthma quality of life of 1.0 points (95% CI 0.5 to 1.5; p = 0.004) following treatment with inhaled mometasone compared with placebo in the eosinophilic asthma group and of 0.2 points (95% CI −0.3 to 0.6; p = 0.43) in the non-eosinophilic asthma group (mean difference 0.9, 95% CI 0.27 to 1.43; p = 0.008, fig 3). Figure 3 Primary outcome measures in study of inhaled mometasone versus placebo in patients with eosinophilic and non-eosinophilic asthma. (A) Concentration of methacholine provoking a fall in FEV1 of 20%. (B) Juniper asthma quality of life score. Open symbols indicate mean/geometric mean values. Secondary outcome measures are given in table 3. We describe 12 patients with symptomatic asthma who had a distinct sputum and bronchial biopsy pattern characterised by the absence of eosinophilic airway inflammation and a normal subepithelial layer thickness. In common with previous reports, patients tended to be non-atopic middle aged women. Some had sputum evidence of neutrophilic airway inflammation, although increased neutrophil numbers were not evident in bronchoscopy samples. Importantly, 8 weeks of treatment with inhaled mometasone had no significant effect on airway responsiveness and asthma quality of life compared with placebo. This was in contrast to findings in patients with asthma and eosinophilic airway inflammation where inhaled steroids were associated with a marked improvement in these measures. Our patients were sufficiently symptomatic to warrant an increase in treatment based on their Juniper asthma control score and all had clear objective evidence of asthma, so the absence of eosinophilic airway inflammation seen in our patients does not reflect remission of underlying disease. Indeed, they had more symptoms than the patients with eosinophilic asthma who participated in the double-blind placebo-controlled study. The absence of sputum eosinophils was evident before entry into the study and was a consistent feature during the study. No patients with non-eosinophilic asthma had evidence of eosinophilic airway inflammation on bronchoscopy or in the six sputum tests done throughout the study, five of which were done off inhaled corticosteroids. These observations support the hypothesis that non-eosinophilic asthma represents a stable clinical phenotype which is not solely explained by the effects of treatment.11 Our finding of a normal subepithelial layer thickness in our patients with non-eosinophilic asthma is consistent with the finding by Wenzel and colleagues in severe asthma.7 The fact that thickening of the subepithelial layer is found in patients with rhinitis and in patients with eosinophilic bronchitis without asthma and not in those with non-eosinophilic asthma suggests that this finding may be related to eosinophilic airway inflammation rather than asthma per se. Longitudinal studies have suggested that increased subepithelial layer thickness is a longer term marker of eosinophilic airway inflammation than cell counts,22 so the observation that subepithelial layer thickness is normal in non-eosinophilic asthma increases our confidence that the absence of eosinophilic airway inflammation is a stable feature. We acknowledge that our biopsy study observations were made on a small number of patients and that we did not adjust for multiple comparisons. Our findings should therefore be regarded as hypothesis-generating rather than definitive. However, biopsies were examined blind to patient status and the magnitude and consistency of the effect makes a chance finding unlikely. Perhaps the main point of interest in non-eosinophilic asthma is the suggestion that it represents a corticosteroid resistant form of the disease. Our study is the first double-blind randomised controlled trial to specifically compare the response to inhaled corticosteroids in eosinophilic and non-eosinophilic asthma. The observations were made on a small number of patients and there was a difference in baseline severity of symptoms and airway responsiveness between and within the group which could have compromised our results. In addition, the small sample size means that we had limited power to detect carry-over effects. However, there were clear differences in primary outcome measures that were above the level that the study was powered to detect, suggesting that they were real differences. 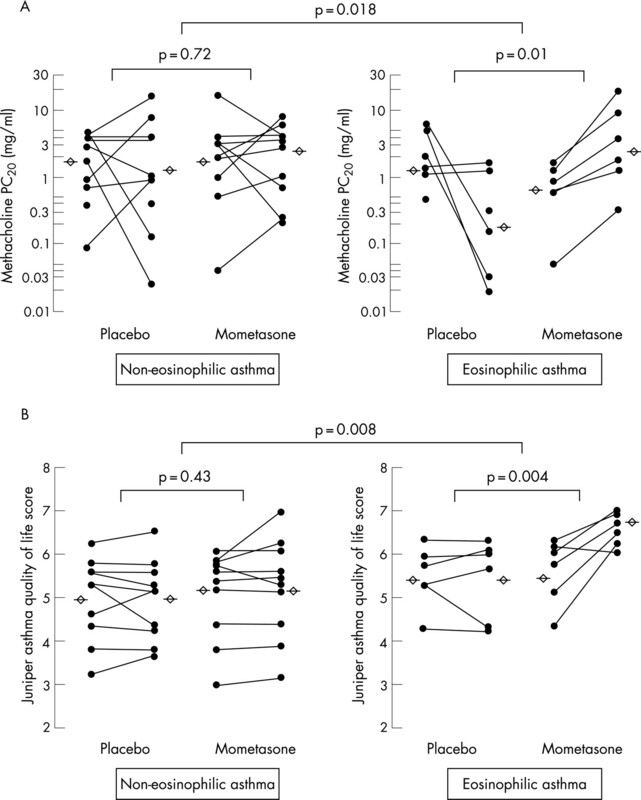 The significantly reduced response to inhaled mometasone in patients with non-eosinophilic asthma compared with eosinophilic asthma is consistent with the findings of previous uncontrolled studies.5 8 9 In contrast to these findings, Godon et al26 found a similar response to inhaled corticosteroids in patients who were classified as eosinophilic or non-eosinophilic on the basis of a single sputum sample. However, these observations were based on an uncontrolled study in patients with symptomatic asthma who were recruited during a period of poor asthma control and it is possible that the improvement seen in patients with non-eosinophilic asthma reflected regression to the mean. In addition, patients were younger and more likely to be atopic than the patients with non-eosinophilic asthma identified by us, so it is possible that the populations were different. Although our study showed a difference in response to inhaled corticosteroids in eosinophilic compared with non-eosinophilic asthma, we cannot conclude from our sample size that there is no significant response to inhaled mometasone in patients with non-eosinophilic asthma. Similarly, our study does not allow us to draw any conclusions about the long-term benefits of inhaled corticosteroids. However, an earlier 12 month study has suggested no increase in exacerbation frequency in non-eosinophilic asthma despite substantial reductions in the dose of oral and inhaled corticosteroids.11 Further appropriately powered studies should address this important question in more detail. Our findings suggest that eosinophilic and non-eosinophilic asthma represent distinct clinical and pathological phenotypes. They provide further evidence against a causal relationship between eosinophilic airway inflammation and variable airflow obstruction and airway hyperresponsiveness, but provide support for the concept that airway hyperresponsiveness and variable airflow obstruction are causally related to the presence of tryptase positive mast cells in the airway smooth muscle. We have shown that patients with non-eosinophilic asthma have a significantly reduced short-term response to inhaled cortico-steroids than those with eosinophilic asthma. Longer larger studies are required to determine whether inhaled corticosteroids can be safely withdrawn in patients with this asthma phenotype. Further information is given in the online supplement available at http://thorax.bmj.com/supplemental. The authors thank Natalie Neale and Will Monterio who assisted in the processing of bronchial biopsy and induced sputum samples.
. A clinical classification of asthma. Am J Med Sci 1921;CLXII:802.
. Heterogeneity of bronchial asthma. Sub-populations—or different stages of the disease. Allergy 1981;36:3–14.
. The immunopathology of extrinsic (atopic) and intrinsic (non-atopic) asthma: more similarities than differences. Immunol Today 1999;20:528–33.
. IL-4 and IL-5 mRNA and protein in bronchial biopsies from patients with atopic and nonatopic asthma: evidence against “intrinsic” asthma being a distinct immunopathologic entity. Am J Respir Crit Care Med 1996;154:1497–504.
. Heterogeneity of airway inflammation in persistent asthma : evidence of neutrophilic inflammation and increased sputum interleukin-8. Chest 2001;119:1329–36.
. Accuracy of eosinophils and eosinophil cationic protein to predict steroid improvement in asthma. Clin Exp Allergy 2002;32:1096–103.
. Prominent neutrophilic inflammation in sputum from subjects with asthma exacerbation. J Allergy Clin Immunol 1995;95:843–52.
. A comparison of the validity of different diagnostic tests in adults with asthma. Chest 2002;121:1051–7.
. IL-4-expressing bronchoalveolar T cells from asthmatic and healthy subjects preferentially express CCR 3 and CCR 4. J Allergy Clin Immunol 2005;116:594–600.
. Exhaled and nasal nitric oxide measurements: recommendations. The European Respiratory Society Task Force. Eur Respir J 1997;10:1683–93.
. Histamine and methacholine inhalation tests: tidal breathing method; laboratory tests and standardisation. 2nd edn.Lund, Sweden: Astra-Draco, 1994.
. Induced sputum and other outcome measures in chronic obstructive pulmonary disease: safety and repeatability. Respir Med 2001;95:999–1002.
. Measuring quality of life in asthma. Am Rev Respir Dis 1993;147:832–8.
. Induced sputum inflammatory mediator concentrations in chronic cough. Am J Respir Crit Care Med 2004;169:15–9.
. Comparison of airway immunopathology of eosinophilic bronchitis and asthma. Thorax 2003;58:528–32.
. Airway structural alterations selectively associated with severe asthma. Am J Respir Crit Care Med 2003;167:1360–8.
. Airway inflammation, basement membrane thickening and bronchial hyperresponsiveness in asthma. Thorax 2002;57:309–16.
. Idiopathic chronic cough: association with organ specific autoimmune disease and bronchoalveolar lymphocytosis. Thorax 2003;58:1066–70.
. Non-eosinophilic asthma: importance and possible mechanisms. Thorax 2002;57:643–8.
. Assessment and evaluation of symptomatic steroid-naive asthmatics without sputum eosinophilia and their response to inhaled corticosteroids. Eur Respir J 2002;20:1364–9.